Notably, those average prices made June 2009 a record-breaker. The average comic book offered in Diamond's top-sellers list sold for $3.50; the average price of all comics ordered was $3.46. The first of those figures ties an all-time monthly record set in November 2008; the second figure is an all-time record high outright. The previous record was $3.41, set in January, February, and March of this year. The Diamond-era records page has been updated. Something new is that $3.50 is actually the median price (or middle price) of all comics offered within the Top 300. The price had been sticking at $2.99, even as the averages went up past it; there were enough lower-priced titles in the catalog to keep the median lower. This is a jump we've been watching for during recent times, and it finally happened this month. However, the mode — the price most comics within the Top 300 are at — remains at $2.99. 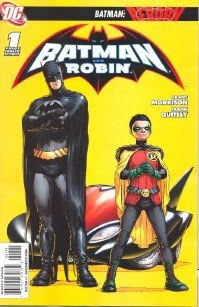 There are 138 comic books priced at $2.99 in the Top 300; 116 priced at $3.99. The intermediate step of $3.50 only accounts for 24 titles. The rankings find that Grant Morrison and Frank Quitely's Batman and Robin #1 took the top spot, followed by Marvel's return of Steve Rogers in Captain America #600. Cap, priced at $4.99, was the top dollar comic book. DC's Final Crisis hardcover was the top-selling item on the graphic novels list. 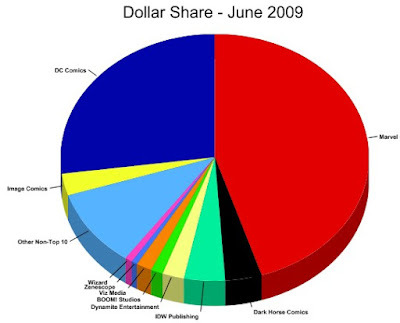 The top six were the same for both unit and dollar market shares overall: Marvel, DC, IDW, Dark Horse, Image, and Dynamic Forces. As with last month, Diamond sent out a second resorting of the list in addition to its Top Independents file — a "Small Press" chart listing the Top 25 publishers outside the Top 10 publishers. (This added one title — Archie, in 307th place — to the overall data set.) Diamond also released two new lists, sorting the Independent and Small Press graphic novel sales, listing 25 items each. Diamond Director of Marketing Dan Manser said the new lists represent more ways to look at the charts, spotlighting titles for retailers and readers. Again, estimates will be along soon, but it looks at first blush that June is at least better than the moribund May. If, for example, Batman sales held steady to what they were equal from month, this month's Top 300 list would then include 7% more units and 12% more dollars. However, fluctuations in that title from month to month could cause these estimates to vary in either direction. June 2008, while less challenging to beat than May 2008 was, still included Secret Invasion #3, Ultimate Origins #1, and Final Crisis #2, so there are still challenging comparatives — but this June at least has the benefit of more high-profile releases than the previous month did. More later. We're now on Twitter; follow us for updates when the estimates become available.